The iconic 2012 "Black Swamp" E98 find in an Ohio Attic stands as one of our illustrious hobby's most incredible cardboard discoveries. 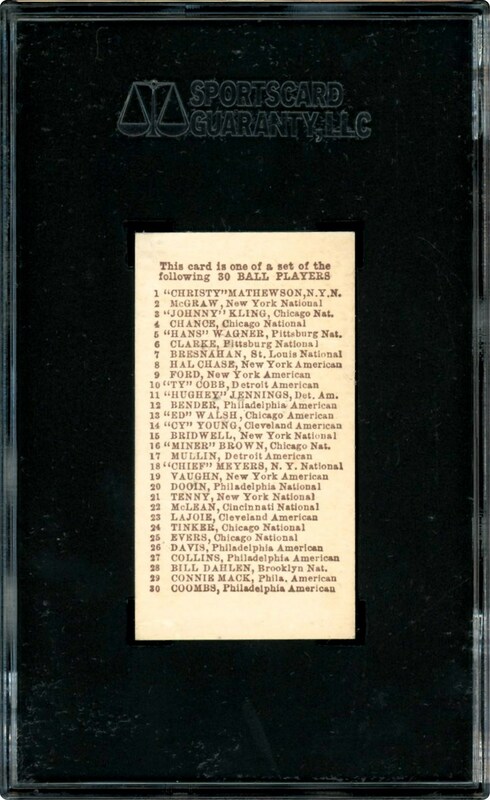 Indeed, along with such monumental finds such as the 1952 Topps vending case and "Lucky 7" Ty Cobb ad backs, it elevated the card market to another level in the eyes of the collecting community. As with virtually any of the pre-WW1 sets, the two most valuable and desirable E98 subjects are Ty Cobb and Honus Wagner, with an absolutely extraordinary Black Swamp green background Wagner offered here in a brilliant SGC NM+ 86/7.5 holder. One of only 2 specimens at this lofty plateau, a mere 10 E98 Wagner's have been graded higher! Synonymous with Honus Wagner's card market stature comes along this pinnacle E98 offering, for it is Wagner's "Holy Grail" T206 subject that s the foundation of the hobby. Hans' irrefutable status as baseball's greatest all-time shortstop likewise elevates his highly coveted cards to a lofty level, and we simply cannot imagine many cards that could possibly compete with a 108-year old NM+ 7.5 masterpiece. 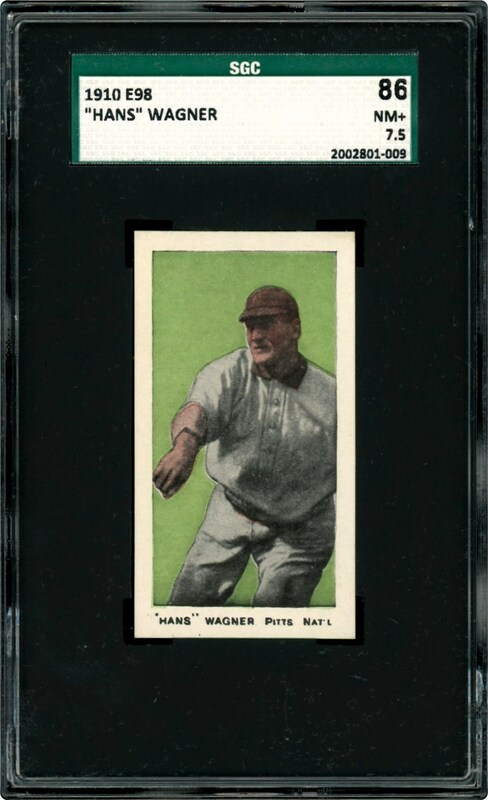 Similar to Wagner's playing prowess, virtually every technical aspect of this world-class marvel is consistent with an impeccable card including his sparkling/timeless throwing image, immaculate tranquil green background, nearly "dead-on" 50/50 centering, blinding white borders and sharp corner tips. A bona-fide "keeper" to say the least, most collectors would concur that a century old+ Honus Wagner card carrying a Near-Mint+ assessment merits the utmost attention from even the most meticulous collector!